Is Wage Theft Inevitable without a Fixed Time Clock? New York Finally, it’s settled. The Supreme Court refused to hear the last gasp appeal from the industry that represents homecare employers, so it is now indisputable that homecare workers will be eligible for the minimum wage and overtime pay. This issue has been a festering sore since domestic and household workers were included in coverage under the Fair Labor Standards Act when amended in 1975 and set for full compliance in 1978-1979. We organized the Household Workers Organizing Committee in New Orleans to take advantage of the fact that they would be covered under what many of them called the “top wage,” rather than the minimum wage then. Now, the question will be whether or not homecare workers will really receive the money, especially the overtime. Like other informal workers and even the much touted “gig” workers celebrated by techsters and others without a fixed workplace and a reliable time clock will wage theft become simply a given assumption as part of the terms and conditions of employment? The promoters endlessly flack the flexibility supposedly enjoyed by informal workers, but is this a euphemism for instability and an invitation for wage theft. Transportation is perhaps the best example of the penalties experienced by non-workplace based workers. 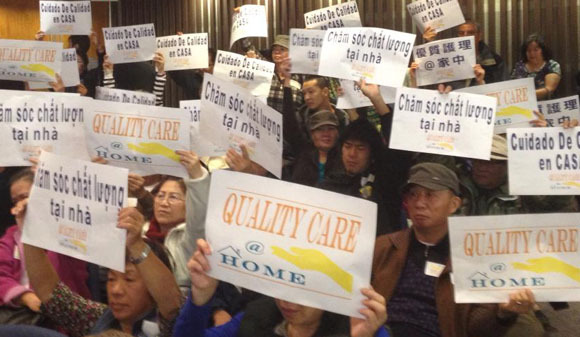 Over the years, the nonpayment of hours spent in transportation to various worksites by homecare workers was frequently an invaluable tactic for our unions to create leverage at the bargaining table or to punish recalcitrant homecare employers. The FLSA has a number of advisories on how to handle transportation between your home and the central office of the employer. It’s common knowledge that transportation time to and from your workplace is not compensable under FLSA, but when you don’t have a fixed workplace how do you calculate your hours when you are going from worksite to worksite during the day as homecare workers do or are moving from place to place on assignment as part of your job? The DOL Wage and Hour Division is clear. Essentially, once you discount the “normal” travel period back and forth between you home and the central office of the employer, the rest of the hours of travel between client locations is all compensable. For years homecare companies have tried, many times successfully, to only count the hours when a worker is with the client and walk away from their obligation by assigning three or four clients to a worker’s day spread out throughout a city and making the worker eat the travel time. The same is true if a worker’s hours would normally end at a certain time, but they have been sent to the far reaches of Los Angeles County or an outlying borough of New York or a neighboring county or parish in the metro area of any city. If rather than the usual thirty minutes of travel to home, they would have to log in another 30, 60, or 90 minutes, all of that additional time is compensable, including overtime if applicable. I don’t see too many hands up from people who are seeing these hours paid, but the examples are numerous for any workers on the move from worksite to worksite, whether formal or informal. It would seem if you don’t have a time clock, you can assume you will experience wage theft. Why isn’t there an app for that? There are apps that tell you how many steps or miles you have walked in a day or how many calories you had for lunch or where the nearest bus stop is or how long it might take a taxi to get to you, but are you telling me that there is nothing that can verify a worker’s hours adequately to be used by both an employer and the DOL to assure that a worker is paid fairly? Certainly, there must be, but as long as it’s not in the interests of the employer to use it and DOL is powerless to enforce it, wage theft seems like it is just part of the not so hidden subsidy that lower waged workers pay to keep the companies in the service economy sitting on their shoulders and swimming freely on their sweat. This entry was posted in Citizen Wealth, Financial Justice and tagged homecare workers, overtime pay, wage and hour, worksite travel by Wade. Bookmark the permalink.